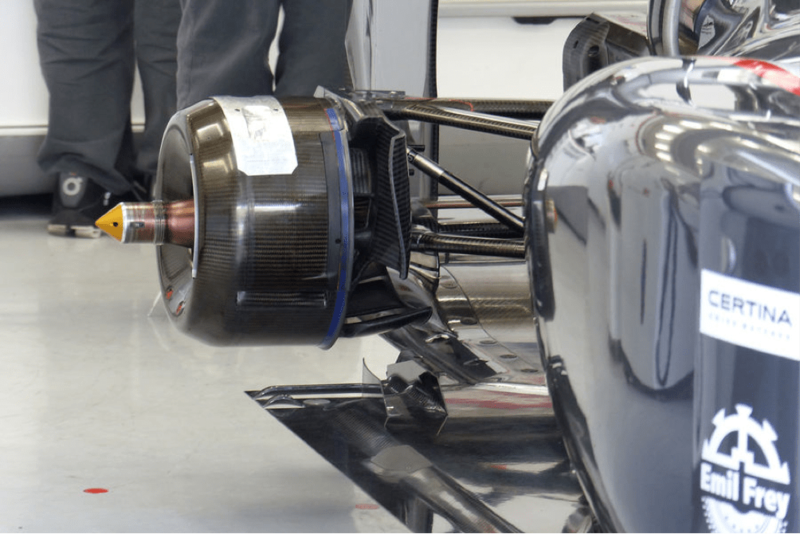 #F1 Forensics: Brake-By-Wire, a real electronic revolution? The first thing that comes to mind when we think of the upcoming season is most definitely the new turbo engines, the new aerodynamics regulations and the limited amount of fuel. But there is an element that could affect performance of the cars, that is not mentioned much: Brake-By-Wire. In 2009 KERS was introduced to Formula 1 cars, a system that recovers the kinetic energy during braking to recharge a battery and allows the driver to use this energy (via a button on the steering wheel) as and when needed, but limited to 6s per lap. From this season onwards, KERS has grown up and is now called MGU-K (ERS-K) and it now has a twin brother called MGU-H (ERS-H) who’s job it is to recover energy from the exhaust gasses that power the turbocharger. The new regulations has raised the amount of energy that can be harvested during braking from 400KJ to 2000KJ per lap, resulting in significant changes in the efficiency of the elements that make up the braking system. As a result teams now make use of smaller rear brakes disks, and from this year teams have adopted four piston calipers rather than the standard 6 piston calipers, still used at the front. Engineers recognised that the braking capacity provided by MGU-K and MGU-H will be such that it will make braking problematic for the drivers. In 2009, the first year of using an energy recovery system, there were several drivers who had issues in managing the braking distance which varied significantly when KERS was charging or not. Over time, the adoption of appropriate electronic strategies allowed teams to eliminate the problems and allowed exploitation of an even more exasperated braking phase. Since the MGU-K system has twice the power compared to the old KERS (80 bhp vs 160 bhp), it is crucial that engineers find a way to keep the car as stable as possible when the driver push the brake pedal. And this is where Brake-By-Wire comes in. Thanks to special electronic mapping will modulate the power to give to the rear brakes, according to the pressure exerted on the brake pedal, while at the same time take into account the energy taken from the brake discs by the MGU-K. This will ensure stability to the car while braking, but importantly relieve the driver from the task of having to change his brake distribution to ensure the ERS recover enough energy trough the MGU-K.
To understand how complicated this kind of system is for engineers – after the first winter testing session in Jerez, the Sauber F1 Team rebuilt the whole system because it was mis-calibrated and caused their drivers to lose control and spin the car several times. Given that the braking phase will still be crucial for good lap times, it’s easy to understand how important it is to have a good Brake-By-Wire system is. While everything on the car is controlled by the ECU and engineers have their hands full just to understand the system the options available to them are endless. Without doubt a few would have been thinking how to gain extra benefits out of the system, benefits such as ABS or a form of traction control. Time will tell however we will be seeing some very clever use of the new ERS system over the course of the year and years to come. I like the fact that the teams who believed in KERS from the start, Mercedes and Ferrari, now seem to be rewarded with better understanding of the various elements of this new formula. Red Bull, with firstly no KERS, then mini KERS and on to a full KERS fitted in the past couple of seasons seem to be the most affected, and Marussia who also didn’t have KERS for a few seasons after everyone else too. For me it’s looking like those early adopters are benefitting from greater understanding. Well, that’s what it looks like anyway, it could be coincidence. it’s not a coincidence that you mentioned Mercedes and Ferrari in my opinion. Speaking about this year, they were capable to build and develop their PU togheter with the car, this gave them a better knwoledge of what would have been the cooling requirements of the new PU. So does this mean we won’t see a driver change the brake bias from front to rear or vice versa on certain parts of a circuit? Because you say the rear discs and shoes are smaller and therefore maybe not up to the task if they play around with the bias, especially in the beginning of the season when there might be “kers” issues. Exactly, it will be managed trought the use of an electronic control unit. The brake bias will drastically change this year, we should pass from standard 60/40 we had until last season to a possible 70/30 or even 80/20, this could explain the huge amount of front lock up we saw in Bahrain. So it might be that the driver gets surprised by the brake bias. ..
Is this a grey area where it is not quite ABS, and therefore not banned? I thought Mercedes AMG High Performance Powertrains at Brixworth did that. The McLaren system is developed by their Japanese partner Akebono. I don’t know who makes the Mercedes version of the brake-by-wire? Graet stuff Lorenzo. Break-by-wire was eclipsed by the noses and by the powertrains, but it will be huge at this season. Could we have another Benneton Option 13 on the cards? Nice 1 Lorenzo, all your tech pieces have be great and getting better every article. I love this side of F1 it’s why I will never get fed up it. The last year RedBull pretty much deserved the title just for their inovative solutions alone! It’s shaping up to be a very…….I won’t say classic year but a very interesting one. I’m looking forward to seeing how different manufacturers systems stand up in a variety of situations, maybe Ferrari have the best turbo and MGU-h and Merc the best MGU-k and Renault the most clever engine maps and different types of tracks will suit different aspects if the power unit. I predict many different winners this season.